Q: We’re remodeling our kitchen and need to install upper cabinets that are low enough to comfortably reach the shelves but high enough so that the countertop doesn’t feel cramped. What’s the perfect upper cabinet height? And from where do I measure it? 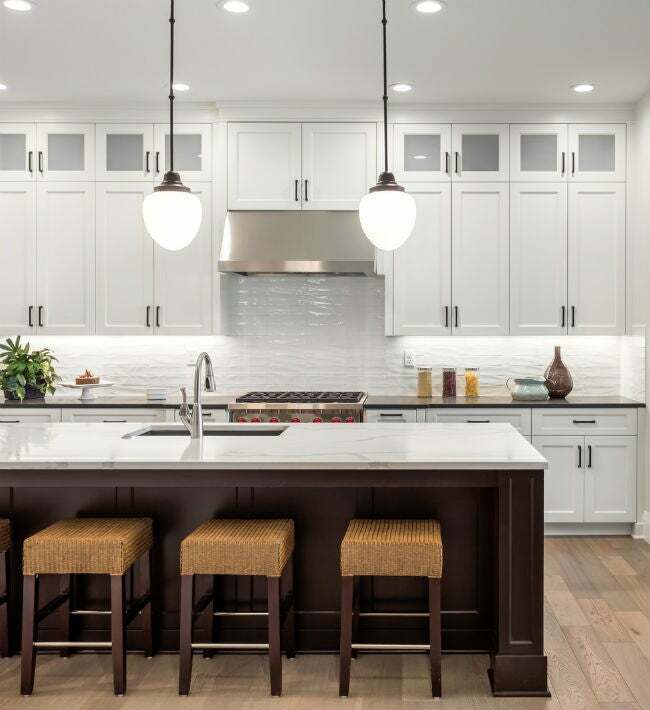 A: The ideal height at which to install upper cabinets depends on a combination of factors—the height of base cabinets, for starters, as well as countertop thickness, backsplash height, and whether or not there’s a range to consider. And then how you measure this height will vary based on whether you’re installing the cabinets before or after the installation of the base cabinets and countertop. Regardless, the ideal upper cabinet height will allow a household member of average height to reach those shelves from a standing position without straining the arms or back or even climbing on a step-stool. Read on to determine how high up the wall to mount cabinets in the kitchen, laundry room, or basement bar—and the tips to do so like a pro. In other words, hang upper cabinets 18 inches above the top of the countertop. If you installed your base cabinets and countertop prior previously, you can use the top of the countertop as a reference. The height between the top of the countertop and the bottom of the upper cabinet should be 18 inches, the height of a standard backsplash. Lower the height to 48 inches from the ground to accommodate those with limited mobility. 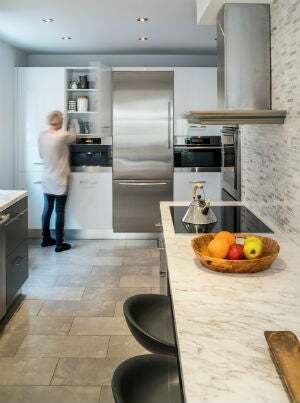 If anyone in your household uses a wheelchair or has a physical condition that prevents him or her from reaching cabinets at the recommended height, adjust the upper cabinet mounting height so that the bottom of the cabinets sits 48 inches off the ground or 14 inches from the top of the countertop. These figures factor in an ADA-compliant base cabinet height of 32-½ inches, a 1-½-inch-thick countertop, and a shorter 14-inch backsplash. This adjusted upper cabinet height also benefits children and adults of smaller-than-average stature who may not otherwise be able to reach upper cabinets at the 54-inch mounting height. 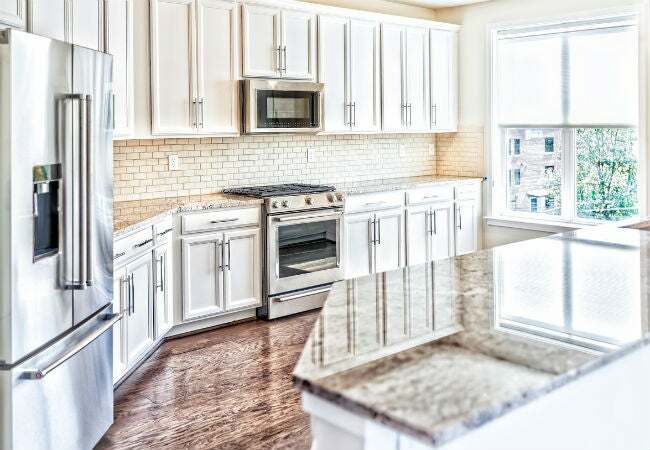 Factoring in these clearances (and, again, the standard base cabinet height and countertop thickness of 34-½ inches and 1-½ inches, respectively), the base of upper cabinets should sit 66 inches from the ground if you have an electric range or 72 inches from the ground if you have a gas range—regardless of whether or not you have a range hood installed. Factor in the height of ceilings and trim when determining cabinet size and position. Cabinets are sold in standard heights of 30, 36, or 42 inches. With an upper cabinet mounting height of 54 inches, the top of the upper cabinets would sit at 84 or 90 inches off the ground for the shortest of standard cabinets. A 42-inch cabinet would touch the top of an 8-foot (96-inch) ceiling or might not fit at all if you have soffits, crown molding, or other ceiling trim installed. To avoid having to recalculate the upper cabinet height and cramping your countertop workspace unnecessarily, consider adjusting the size of cabinets going in. • 42-inch cabinets are preferable in rooms with 9-foot ceilings with no trim or trim up to 12 inches in height. Measure, mark, and hang! Once you determine the ideal upper cabinet height for your needs, use a measuring tape to measure this distance from either the ground or the top of the countertop, then pencil-in a horizontal line at that height on the wall. (Check with a level before moving on.) Use a stud finder to find the wall studs along this line, then temporarily mount a ledger board to these studs with screws. The board—which should be installed just below the pencil line so that the bottom of the cabinet sits level at it—will support the bulk of the cabinetry weight during installation. After you lift each cabinet onto the ledger board, you can use your free hand to mount it at the stud locations with screws. When you’re finished installing all cabinets, attach the cabinet doors and hardware and remove the ledger board for the big reveal.